This is full of advantages and has no discernible disadvantages. First, it uses no gas. There’s a cost savings, an environmental savings, and a noise savings. I can mow the lawn whenever I want and bother nobody, and I don’t spew pollution into the atmosphere every time I do it. This is what got me looking in the first place and it’s a big selling point. Second, it’s inherently a “mulching mower”. It doesn’t leave ugly rows of grass clippings or require disposing of bagged clippings. 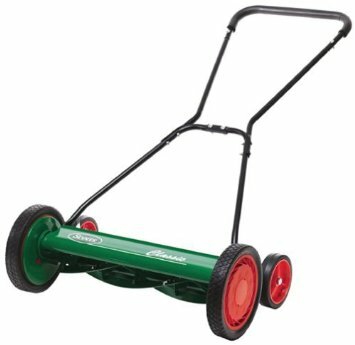 It conveniently leaves the clipped grass right where it started, where it serves as fertilizer for the lawn. Third, it’s faster and easier to use. For straight rows of grass it’s no easier or harder than a gas mower; you just push it down the row. (And no, it’s not even a tiny bit hard to push.) But it corners more easily and can handle edges that might be dangerous for a gas mower. For example, I can push it more slowly over rocks, so if one does get kicked it up won’t do any harm — a gas mower would kick the thing right up. I can mow our entire yard, front and back, in about 10 minutes. That’s about as much time as our neighbors spend yanking fruitlessly on the starting cord for their gas mowers. 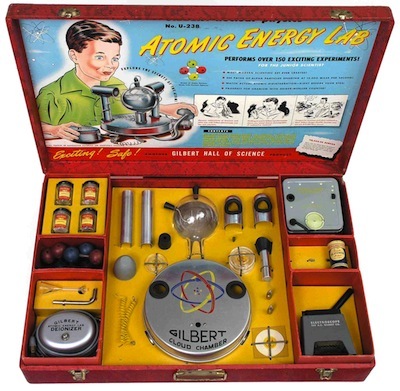 The Gilbert U-238 Atomic Energy Lab is clearly the greatest toy ever invented. I had a pretty fancy “200-in-1” electronics kit of my own as a kid with a light bulb, buzzer, and other components for building radios and other basic circuits. Unlike the U-238 Atomic Energy kit, mine did not include four separate radioactive elements or a certificate to order replacement radioactive elements when the included samples inevitably “deteriorate” over time. I recently signed up for the financial website Mint to see how it compared to our existing financial organization (a fancy Google Spreadsheet). Though Mint came highly recommended, it doesn’t compare favorably. Mint does a good job of aggregating account information in one place, so I can now see on a single screen our credit card charges, banking transactions, investments, mortgage balance, and home equity (using the current estimate for our property’s market value from Zillow). This gives an excellent picture of our net worth at a glance, which is fun to see. 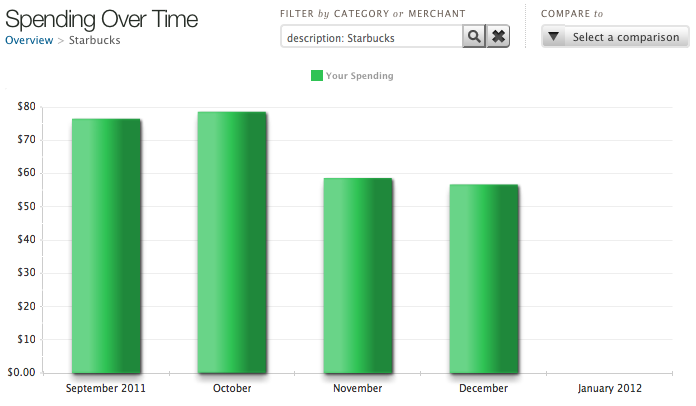 The site then categorizes expenses and graphs your spending on coffee (for example) over time. This is imperfect but it’s easy enough to correct errors. But the point of any financial tool isn’t to analyze past spending but to budget future spending. Mint’s offering there is fairly weak. 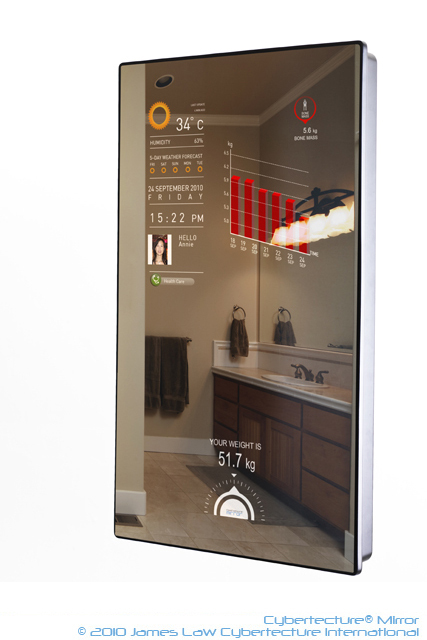 The entire model is built around categories so you can budget your coffee consumption or groceries for the month. That’s not a bad idea, but it overlooks several major aspects of how people spend money. I’ll outline five of them. First, our real budget accounts for several fixed once-monthly expenses like Netflix. That’s clearly an “Entertainment” expense, but it’s not really an optional expense from month to month. Unless we cancel the service, Netflix will charge us exactly $7.99 at some point in January, which means we have $7.99 less to spend than our paychecks say. The same is true for phone service, cable television, and other monthly activities. In Mint, though, you can’t track particular bills; you can only track categories. It might report that you’ve got $30 left for entertainment, but does that include Netflix? Or do you really only have $22.01 left? Second, we account for some variable once-monthly expenses like our electric bill. I don’t know the amount for January’s bill but I know we’ll get one. This means our budget may set aside $200 for electricity but when the bill arrives we pay only $100 then we instantly have an extra $100 to spend on something else. In Mint, if your utilities budget is $200 and you’ve spent only half of it, the other half is still ready to go. There is no concept of being “done” with an expense. Third, Mint does allow some control for unusual or one-time expenses in that you can set a budget for a certain category in only one month, but the reasoning is opaque. In my spreadsheet I may add a line for “Dentist Appointment” but in Mint I must instead increase the budget in my “Health & Fitness” category by that amount. If the appointment moves I have to decrease this month’s amount and increase next month’s. Finally, Mint’s budgets are generally confined to a single month; there’s no clear picture of the annual budget. We pay our car insurance premium in full in January and July, which means we overspend dramatically those months. January’s budget alone makes us appear to be living well beyond our means. But a complete annual budget shows that we more than make up the difference in the other ten months and in fact save nearly $200 on our premium in the end. The area where Mint works well is for ongoing expenses like groceries and entertainment. 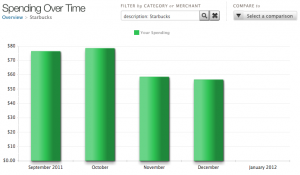 As long as your spending categories align with your budget categories, the budgeting tool works well. What you can’t do is budget entertainment and clothing as a lump sum while still tracking spending in each category separately. I update our budget spreadsheet every day with our most recent expenses. The task is the worst part of a spreadsheet budget and it’s what Mint does best. For Mint to be useful as a financial tool, the budgeting needs to improve. I’d like to see a focus on (and organization around) expenses: the kind you know in advance and the kind you don’t. Categories are great for analysis, but they shouldn’t be so critical in budgeting future spending. And there needs to be a better “big picture” view of an entire year (or more). Mint is already immensely powerful and it’s completely free. As several people have pointed out to me, for someone who doesn’t already have a household budget, Mint would be an excellent place to start. And maybe after a while you too can setup a Google Spreadsheet! Progressive offers a discount program called Snapshot where they electronically monitor your driving “to get away from the law of large numbers and focus on how you personally drive” (says my agent). When do you drive? Midnight to 4 am are “high risk” hours. On weekdays, “medium risk” times are 4 am to 9 am, 3 pm to 6 pm, and 9 pm to midnight. On weekends it’s just 4 am to 6 am and 9 pm to midnight. All other times are “low risk”. How far do you drive? Averaging less than 30 miles per day (over a one week period) is good. How hard do you brake? Decelerating at 7 mph per second or faster is bad. That last one is the hardest to intuit, since we don’t have deceleration gauges in our cars. Twice this week I’ve braked suddenly to avoid hazards (e.g., the guy who merged into my lane while I was still in it), and neither registered as a “hard brake”. Two others that didn’t feel sudden to me at the time did register. Progressive is aware, of course, that sometimes stopping short is the safest maneuver. As my agent put it, “As your insurance company, we’d rather you brake hard than make us buy you a new car.” But doing it too often suggests you’re following too close: you should have time to decelerate gracefully even when the car in front of you stops. 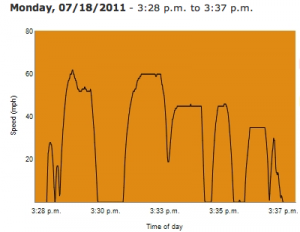 The website shows a detailed graph of your speed during each “trip” (each time the ignition was started and then stopped). Knowing the route, it’s easy to figure out what happened when. Here, I left our neighborhood for the 60 mph highway, stopped at a red light in the middle, decelerated to turn onto a 45 mph road, et cetera. I can even see where I stopped at a light, inched into the intersection when it turned green, and then made my left turn. But presumably you wouldn’t have deduced my route from my speed alone, and neither can Progressive. The tracking device does not have GPS installed. Progressive offers an initial discount after collecting data for 30 days, then a final discount after six to twelve months. “Final” means Progressive offers an initial discount after collecting data for 30 days, and then a final discount after six to twelve months. That final discount is permanent — you keep it as long as you’re insured with Progressive. When they first offered the program bad drivers could suffer a 5% increase, but they phased that out. Now the worst penalty is “no discount” and the best is 30% off. New trips appear on the website within a few hours. The speed graph is a fixed size, so longer trips just get crammed into the same space, and a lot of the detail is lost. For trips of about five miles, it’s about the right size. The speed graph doesn’t specifically indicate where your “hard brakes” are. You can sometimes tell visually, but it’s guesswork. I just learned about the Optimus Aux, and I already don’t know how I live without one. 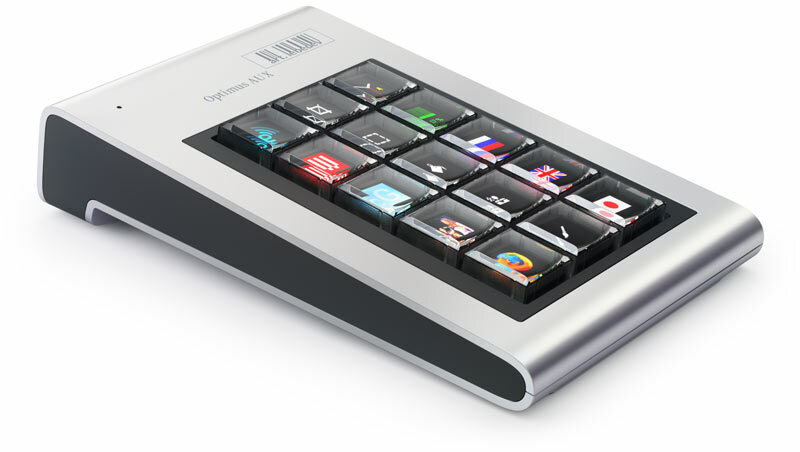 It’s an auxiliary keyboard, where every button has an Organic Light-Emitting Diode (OLED) screen that can display an image customized to its programmed function. The price I’ve seen rumored is $650, or about $43 per button. It’s also not out yet.